Falkreath Watchtower is a ruined watchtower that overlooks the major crossroads of Falkreath Hold. The dirt path leading to the tower is marked by a pile of rocks and is found just west of the junction it overlooks, between the road from Falkreath that passes the Roadside Ruins and the road that runs along the southern shore of Lake Ilinalta. There are several thistles growing along the edge of the path, which curves around and approaches the tower from the west. The grim trophy of a spriggan on the left side of the path speaks to the depravity found in the tower ahead. Just past the spriggan's remains, to the northwest is an iron ore vein. A flight of stone steps leads up to the doorway that forms the entrance. On the ground floor is a toppled set of shelves holding ruined books and some gory human remains. To the right of this are more gory remains on a stake beside the curved stone stairs leading up. The only other items found on this level are three barrels of ingredients and three food sacks. Climbing the stairs leads to the top of the tower, where you'll find a leveled necromancer. There is also the corpse of a female Khajiit, who the necromancer will raise to assist in fighting you. She is not armed, however, so you can safely ignore her and concentrate on him. One amusing way to deal with the necromancer is to keep moving forward in attack, as he will keep retreating until he falls from the tower to his death. There is a central campfire with a soul gem stand in the middle holding an empty common soul gem. To the side is the necromancer's small tent containing a bed roll, a copy of the Conjuration skill book Liminal Bridges and a copy of The Book of Daedra. The only other item of interest is an unlocked chest to the left of the tent. It is referred to in the quest journal as Crossroads Watchtower. 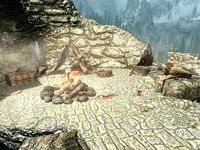 This issue has been addressed by version 2.0.6 of the Unofficial Skyrim Patch; the journal will refer to it as "Falkreath Watchtower" to correct the mismatch.